How do you pack for a trip around the world? The answer: As lightly and minimally as possible! Don't overpack. Leave your rolling suitcase at home, and pretty much everything else you own. You don't want to be burdened by belongings. After all, the trip is about the experiences, not the stuff. You want a backpack. This will allow your hands to be free and provide better mobility. 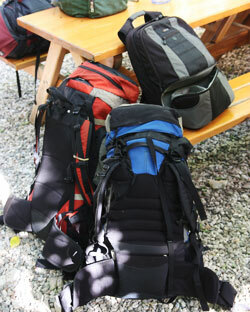 Most long term travelers use a large camping-style backpack along with a smaller daypack. Mount the large pack on your back and put the smaller one on your front side. If you can get away without the smaller front pack, even better, but this will require some serious packing skills. Don't overpack! We've listed our recommended packing list below. This list is based on the hard lessons we learned from our trip (11 months, 23 countries, multiple climate zones). Don't overlook anything on this list, but at the same time, if we didn't put it on this list, we didn't need it. Don't overpack. The amount of camping and wilderness activities you will be participating in. You might need water filters and mosquito nets depending on your destinations. You can do laundry anywhere. Services for travelers are available everywhere. You can buy stuff when you get there. If you think you will need more of something (such as shampoo), plan to buy it, don't pack it all at the beginning. You can throw stuff away, give it away, or even ship it home if you don't need it. Of course, all of this is just a suggestion, and individual packing lists may vary. If you're planning a trip to Southeast Asia, check out this packing list for the region. And keep in mind that the actual backpack you choose is important, too. Check out these backpacks for Europe, for example.